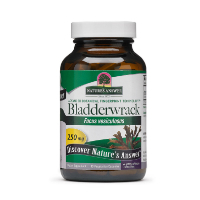 Nature's Answer Bladderwrack Review: Will This Pill Work? How does Nature’s Answer Bladderwrack help promote weight loss? Bladderwrack is a type of seaweed that is typically used medicinally for thyroid health concerns. It is thought that it is effective in helping with weight loss due to the iodine in the seaweed stimulating the thyroid gland, resulting in regulated weight. The thyroid gland is thought to help control a person’s metabolism and help maintain a healthy weight. People who do not produce enough thyroid hormone – for instance a person who has hypothyroidism – may have a sluggish body and experience a change in appetite, which can lead to weight gain. Iodine is thought to improve this condition, but its effects typically depend on the cause of the person’s hypothyroidism. That being said, there is insufficient scientific evidence that bladderwrack may be beneficial for treating obesity or weight loss. While early weight loss research has been conducted in which bladderwrack was used along with vitamins and lecithin, it did not seem to help people either lose weight of keep it off. In short, Bladderwrak, or any other form of seaweed, hasn’t ever been found effective for weight loss. This means that there is no proof or guarantee that taking Nature’s Answer Bladderwrack, will promote a measurable reduction in fat. It should also be noted that bladderwrack can sometimes contain high amounts of iodine. This may make it unsafe for some people to take, including healthy individuals. The reason is that frequently ingesting high levels of iodine can lead to goiter and thyroid problems, including increasing the risk of thyroid cancer. Moreover, bladderwrack can contain heavy metals, such as arsenic, from the water where it lived, and this can be toxic. This herb may also slow blood clotting. You should avoid taking Nature’s Answer Bladderwrack (or any supplement containing this ingredient) until you consult with your healthcare provider. This is especially true if you have a known medical condition, including hypothyroidism, are currently taking medications to treat a health problem, or if you are currently pregnant, nursing or trying to become pregnant.